I awoke to thunder. It was pouring outside. The weatherman said that the rain would end by 9 so I waited it out. When I hit the road it was cool and breezy. The wind from the east was a tailwind for most of the day. I rode through downtown Dyersville. It reminded me of downtown Bloomington Indiana in Breaking Away. I felt like telling a cop that I was a little disturbed by the developments in the Middle East, but I let the moment pass. The riding began with a five mile tailwind. This allowed my legs to ease into the day. The tall grass on the side of the road looked like it had been through a tough time. I rode north under overcast skies. To the north dark clouds loomed. I did a four mile winding descent into Elkport that was quite thrilling. Sometimes even a Mule can fly. Then came the climb. I was warned that this ride would get hillier as I headed north. Roger that. Then it started to rain. I was already a bit chilled and the rain added to my shivers. I stopped and put on my rain jacket. Within minutes it was pouring. And there was thunder. I checked my surroundings for shelter in the event of lightning. Barn. Porch. Garage. The climbing kept me warm but I was starting to worry about my visibility. On a descent I pulled over to put on my blinking light belt. I was quite cold so I zipped up the pockets and pit zips on my jacket. Stopping The Mule took much much too long. Rim brakes are pretty useless when they are trying to stop 270+ pounds going 30 miles per hour in the rain. I had a long downhill to Elkader. No guts, no glory. I made it to the bottom in one piece then started another long climb, perhaps the biggest one since Ohio. About halfway up the beast, I spotted a burger joint with a covered patio. Food and shelter! When I stopped I realized that I was shaking from cold and tired and grumpy. The Google told me there were plenty of options for motels and such nearby. Hmmm. The weatherman said the storm would pass over in about an hour. So I decided to enjoy some fish and chips. Hot food was just what I needed. My focus on rain-related matters had blocked out the fact that I was extremely hungry. I ordered a double dip cone and inhaled that bad boy in minutes. The counter staff advised me that there were plenty of hotels in Prairie du Chien Wisconsin about 30 miles away and just a couple of miles off my route. 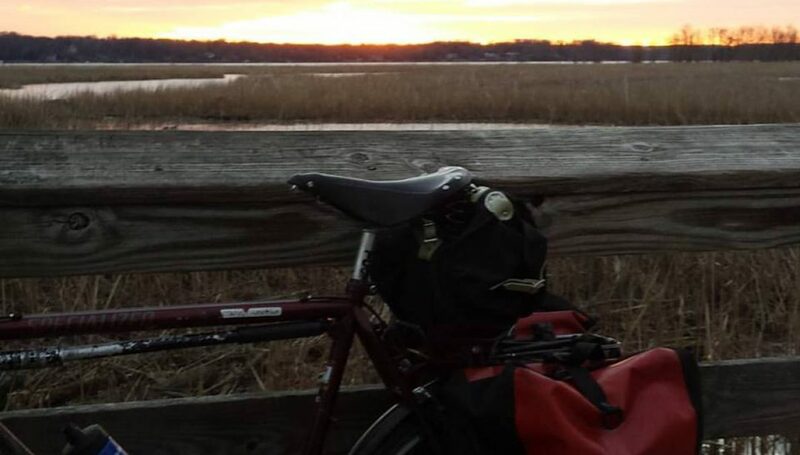 The rain stopped and I decided to ride on to Monona, the day’s planned destination with free camping in the town park. 15 miles of hillage ensued. The town park was lovely but the soggy ground and porta potties turned me off. After a coffee break at a gas station convenience store, I decided to ride 15 more miles to Prairie du Chien. They were remarkably level miles with more Iowa farm views. I passed through the town of Watson. A few miles later I flew down a curving hill to the Mississippi River. It was a thrilling ride. I just took the lane and went for it. As I entered the town of Marquette, I feathered my brakes to bring The Mule in compliance with the town speed limit. I crossed the river to Wisconsin and did the state line sign picture thing. And The Mule and I paid our respects to Father Marquette who “discovered” the Mississippi. After a three mile search for lodging, I ended up at a Super 8 (again) south of town. After cleaning up, I went next door to the family restaurant and had the soup and salad bar. All of it. I discovered that my waterproof Ortlieb panniers leaked quite a bit. The desk clerk at the hotel gave me a roll of plastic bags to wrap my things in. The worst victim of the water infiltration was my ancient copy of Tom Wolfe’s The Electric Kool Aid Acid Test. As I write this it is thundering again. Tomorrow’s route continues on the Iowa side of the river. About six very hilly miles away is Effigy Mounds National Monument. I’d like to check it out but the prospect of rain is putting me off. I understand that the terrain in Iowa to the north is super hilly. Lucky for me, the river road on the Wisconsin side is level. I shall take the path of least resistance. Posted on June 8, 2018 August 8, 2018 by rootchopperPosted in Any Road to the Pacific NorthwestTagged Any Road Tour, Dyersville, Elkrader, Iowa, Ortlieb, Prairie du Chien, Wisconsin. Stay dry! We got caught in that storm yesterday. Flying mule – you may have to get a logo made of that lol, Makes me think of Donkey in Shrek. Sorry to hear about your Ortlieb bags, if the bags are newish I would email them, since water proof is kind of their whole raison d’etre. At least you got some award winning Ice Cream. Yum.